It’s that time of year again! The 3rd annual Movegreen Futures Golf tournament is this Friday, September 20th at Sandpiper Golf course. While the golf portion of the event is SOLD OUT , you can still log on to http://nightout.com/events/sunset-soiree to purchase your Sunset Soirée Tickets ($100/each). The party starts at 5PM this Friday night! As always, all net proceeds go to the Village Properties Teachers Fund!!! We have raised over $115,000 for local schools and kids through the first two years and this year is looking better than ever! Thank you so much for your support as none of this is possible without you! With summer slowly coming to a close, it’s important to keep one thing in mind: always save the best for last! On Friday, September 20, Santa Barbara’s own Movegreen will host their annual cocktail party to benefit the Teacher’s Fund at Sandpiper Golf Club – the fundraiser of the year! What could be better than a party with a purpose? In support of Santa Barbara’s schools & the Teachers Fund, Movegreen is creating an evening-long event that’s both entertaining and for a good cause! Prepare for a classy Night Out with delectable hors d’oeuvres, an open bar with specialty drinks by Boathouse, Casa Blanca, FisHouse & SB Shellfish Co., and great music by DJ Scott Topper of Scott Topper Productions, all overlooking the beautiful Pacific Ocean. Help support local children and teachers through participating in the Sunset Soiree’s auctions, which will benefit Santa Barbara’s Teacher’s Fund as well. Established by Village Properties in 2002, the Teacher’s Fund provides local elementary and middle schools with necessary books and supplies that they lack as a result of budget cuts. Designed to further the education of Santa Barbara’s youth, the Fund gives all of its proceeds directly back to our teachers, so they can help improve their students’ learning environments. Don’t let that fool you – this event will be anything but like the classroom! Win big during the Sunset Soiree’s Vacation Raffle or kick back in the VIP area on Travis Mathew’s brand-new RV party bus. 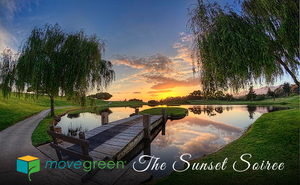 Admire Sandpiper’s view of the sunset with a refreshing cocktail on the RV’s roof as a premiere location along Travis Mathew’s Awesome Tour, or take a stroll through the lush golf grounds between the silent and live auction. At a ticket price of only $100, you too could be relaxing (and fundraising!) in style this September. Enjoy delicious food, try some flavorful drinks, and feel the vibe from the Sunset Soiree’s local, live Santa Barbara DJ Scott Topper – all in support of our community’s Teacher’s Fund. With tickets limited to 200, make sure you get yours fast – the Sunset Soiree is a one-night-only event!